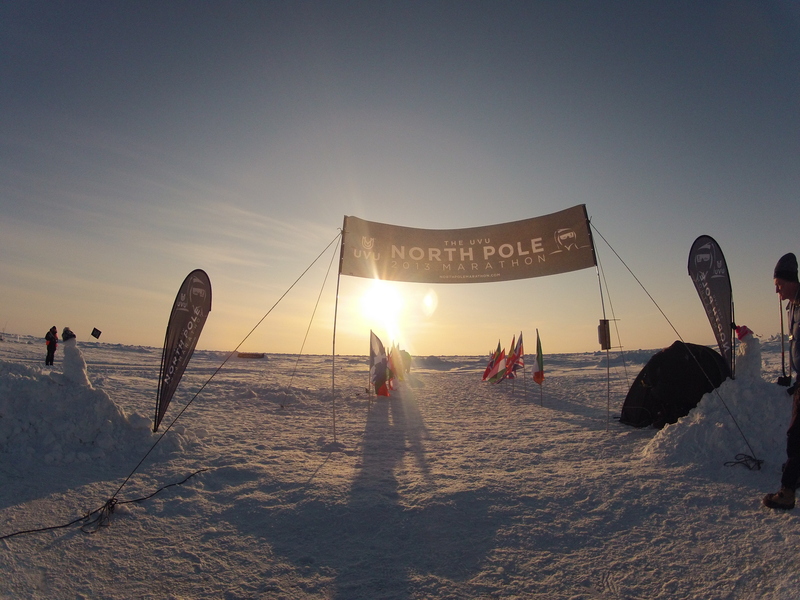 It will take another few days or even weeks to understand what happened up there at the North Pole racing this marathon. And I feel like my body is still working on that even half a week after. 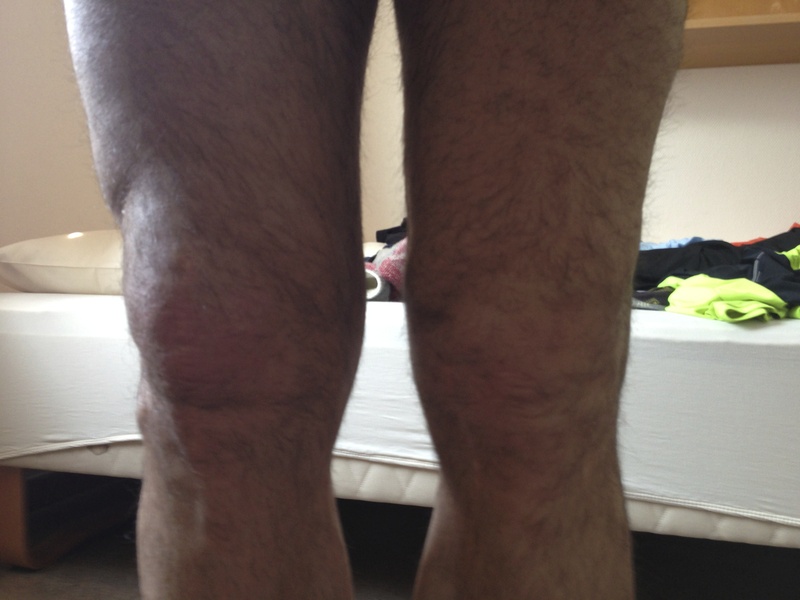 Both knees looked bad and the left one reminds me more on a punching ball than anything else. Even days after i felt those tiny small muscles in my legs I didn‘t even know that they exist. You might know these stories about „that was the hardest I‘ve ever done“ and so on. 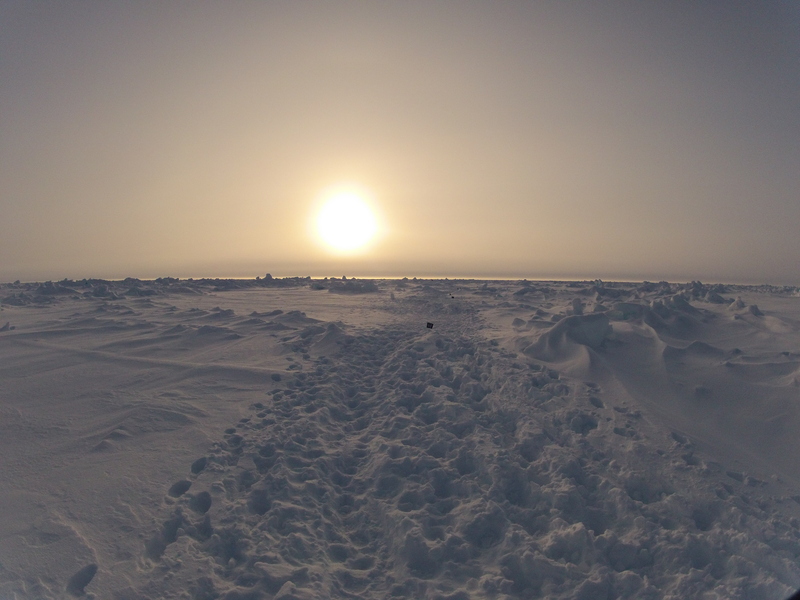 The only thing I can say about this adventure is that I was running, walking, falling and standing up 334 minutes out there at -30°C or even less, on ice and snow. All of that in a place that doesn‘t exist on any map, a piece of ice looking like a white desert with an unbelievable beauty. When we were pushing along those never-ending fields of small ice mountains it was like running on an endless place. Each of us alone, fighting with his own demons trying to catch up with those running out there in front of us. But we have to go a step back to understand it all. Since we landed in Spitzbergen there was almost no more structure in our day. „The days and nights were as one for so long, that we lost track of time. We had no sense of dates or weeks; it was as if we no longer felt time pass us by in the darkness.“ These lines were written by some explorers being up there in winter time, when everything was dark. As we were up in spring the sun was shining almost the whole day and our brain was thinking something like: The sun is still shining, you shouldn‘t sleep now. You could better understand when you see the race video – we were running through the night. The start was half an hour after midnight! We had no sleep at all. Even in the tents – where we tried to relax before the race – it was daytime. And there was almost no time plan as Richard had to be up there first to check the weather and setting the course we heard about the plan to start at 0:30 and we had to stick with that. Let‘s call it a tentative plan to work with. Knowing that it will get very cold I was eating all over the day and fueling my body with carbohydrates, mainly with a solid breakfast, Carbo Basic from Winforce, Winforce Ultra Energy Complex and a dry freezed Müesli about two hours before the race. After a short briefing before the race – Richard said something like: things are going much slower up here than at home. We went outside for a last picture and to jump in a breathtaking adventure which – once again – no one could understand who wasn‘t up there. We had to run a total of 9 laps of about 4.7km. Each one could stop over after a round in the warm tent to eat, drink and heat up. 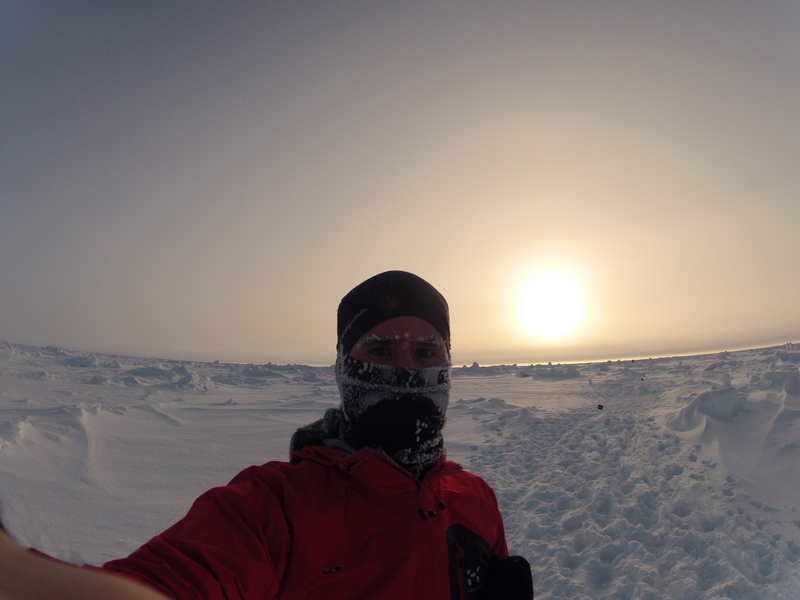 All was easy in the beginning as the a solid track was leading us over about 800 meters on solid hard snow and ice. But then it all ended in a white field for a really long time to come up again with about 1000 meters of solid snow before ending again nowhere. The soft ground was changing between a few centimeters of snow and – depending where you were running – knee deep snow and wholes. The runner on this video is Ian, a 2:40 marathon finisher. Look at his speed and listen to his statement. How true it is. I was planning to go for a non-stop strategy to avoid entering the warm tent and loosing my flow. 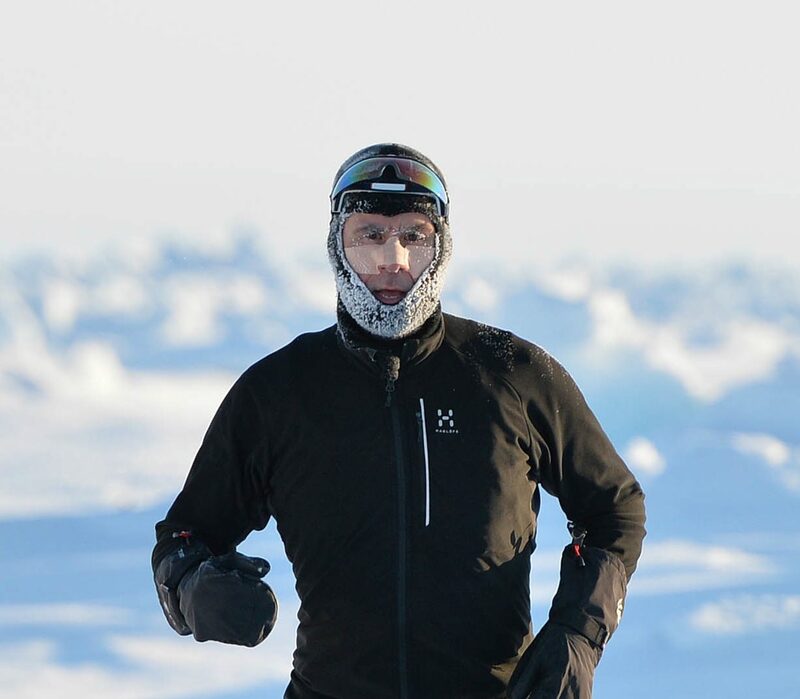 I knew from my tests that it could be possible at a low heart rate (avoid too much sweat), with my excellent running gear (merino instead of synthetics and a breathing outer shell) and with the right food to fight against the cold. That‘s why I was wearing a compact Nathan camelback with a 2 litres bag between layer 1 and two. But guess what. Obviously I wasn‘t closing my camelback properly and it opened in the middle of round 1 making a noise something like „blobb“. Panic! What should I do? Just returning directly to the camp? Following the trail to end up in the camp to change clothes or should I go on without changing? As the water was slowly running down my back and legs to the socks there was no other choice than changing all the clothes – which I had in reserve. It took me almost 15 minutes to change it all and getting on the track again. My replacement top wasn‘t as breathable as the one i was starting with and my heart rate wasn‘t that deep as I expected it so I was sweating quite strong. But the merino’s ability to hold me warm was incredible. Wet but warm I was following almost all of the race and changing my balaclava and merino gloves two times without leaving a lot of time. 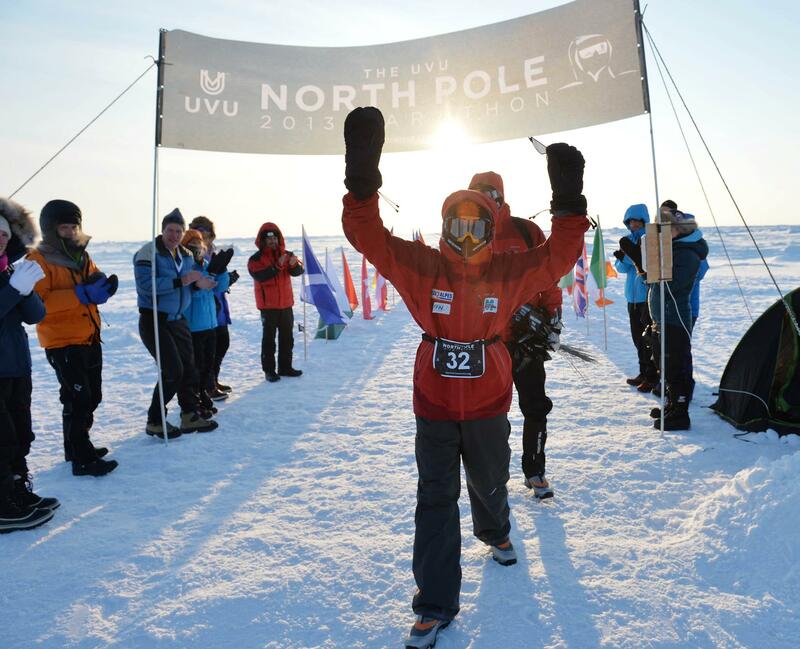 When I hit the finish line I was empty, full of pain and my feet and elbows were cold. Really cold. All was in some way a fight against the time, against the cold that was biting with his long teeth in our skin and driving them round by round deeper and deeper in our body, till everything started to cool down. A few seconds after finishing my body was sending the true and real signals, not the nice ones he did for the last almost 6 hours. It took me a few hours in my sleeping back with a hurting knee and a cramping leg to bring back my body temperature again. Discussing about our times and capabilities we ended up with the theory that most of us had to add a 60% on top of their best marathon running time. So was I – deducting the time I needed to change my cloth. My overall time was a 5:56 and a 13th place overall. How great. More than I expected in a mainly strong and experienced field of marathon, trail and ultra runners. Nobody can understand what happened during the race. It took me hours to come back and my body is still sending crazy signals a few days after all of that. And I am eating like polar bear just to bring back the energy I‘ve burnt in those breathtaking 6 hours that went by like a short run of 30 minutes. Linh Huynh was writing a few days after the race on facebook when she was back in Oslo again: “I have been crying a lot these days. But for today, I will sit in quiet contemplation and try to record the events of the most thrilling 36 hours of my life.” There is nothing to add. And you just did great Linh. Renaud (father) and Erwan (son) were up there too. Both to run and walk for their daughter resp. sister that died last december from cystic fibrosis. Erwan was walking and cheering us up all the time while his father was first finishing the marathon in a 4:34 as second to join then after a short break his son to walk another 7 hours together to finish as a team after 12 hours and 11 minutes! By the way, Erwan is 14 years old! He is the guy I am looking up and I am sure that one day he will realise how strong and great he was on April 9th 2013. Guess who is the guy in red and black running by at 53 seconds?